If you have never made these at home, then this is the tamales recipe for you to try. We are going to break down how to make tamales in your own kitchen. No special equipment required. All you need is a little time and delicious ingredients. 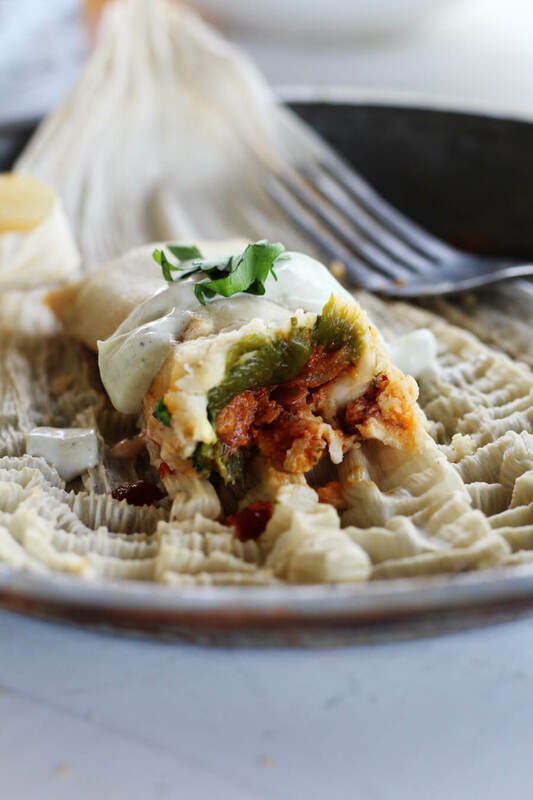 Poblano Chorizo + Cheese Tamales are filled with earthy peppers, spicy pork sausage, and melty manchego cheese. Oh yeah, these are THAT kind of good. 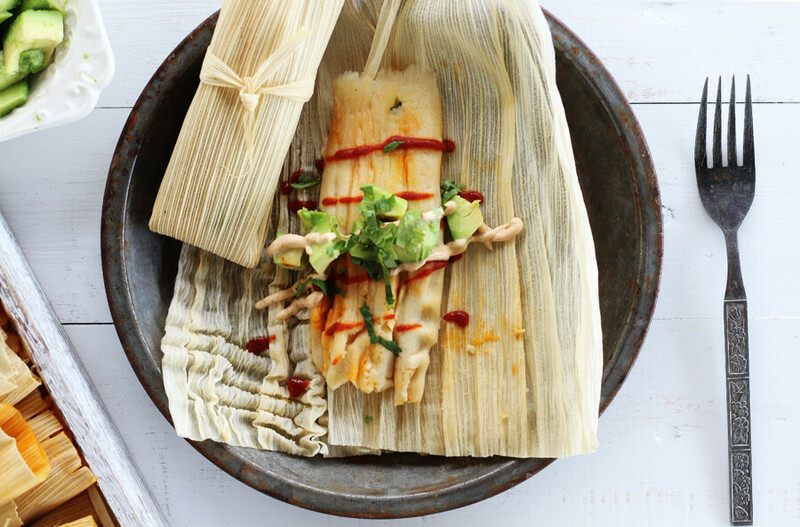 Tamales are one of those delicious meals that seem so intimidating to make. At least to me they are. Or should I say, WERE. Once you jump in and make homemade tamales, you’ll be so glad you did. Tender masa dough filled with savory and spicy fillings and nom nom cheese, topped with your favorite salsa and crema. There are so many (seriously, Google it) variations of tamales. Dating back to around 5000 B.C., the history of tamales travels from the original inhabitants of Mexico and Latin America to various Native American Tribes and even to the Caribbean. I bet if you started asking people how to make tamales, you’d probably get just as many answers. Basically, a tamale is a dough made of corn that has a filling in the center. Typically, the tamale is wrapped in a corn husk or banana leaf and then cooked. Sounds simple enough, right? A delicious meal from very humble beginnings. 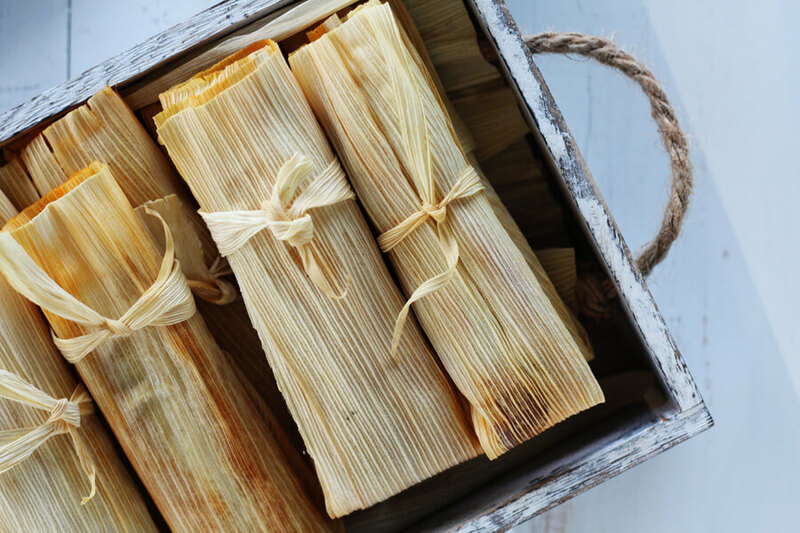 This tamales recipe is perfect for holiday celebrations like Christmas, Day of the Dead, and Los Posadas. Our recipe makes about 15 tamales but is easily doubled or tripled for a crowd. 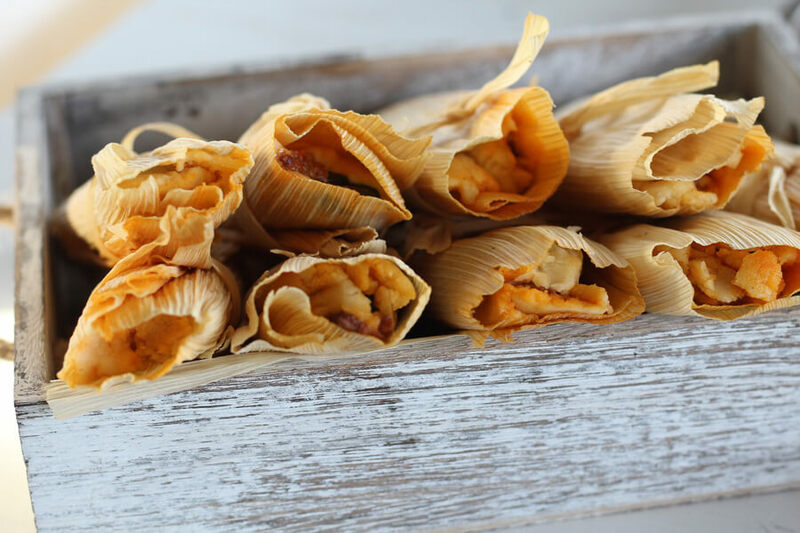 For our Poblano Chorizo + Cheese Tamales, we knew we wanted authentic flavor. Ingredients of choice? 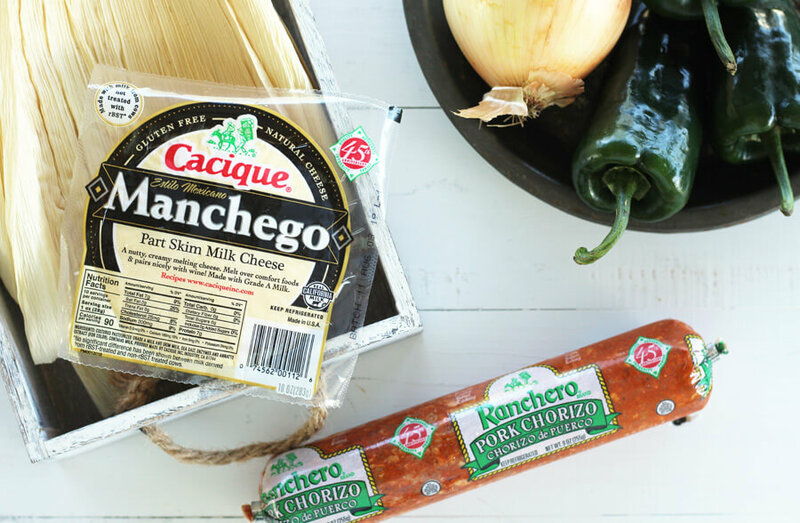 Fresh roasted poblano peppers, Cacique® Pork Chorizo, and Cacique® Manchego Cheese. With Cacique® products, it’s so easy to savor the flavors of Mexican dishes at home with your family and friends this holiday season. Cacique®’s Manchego has a nutty flavor and thick, creamy texture. It smells like sharp cheddar but has the tangy taste similar to Colby cheese. Plus it melts like a dream. When you are ready to make tamales, the first thing you need to do is pick up corn husks. You can find them in the Hispanic Food section of most grocers. At least an hour (up to overnight) before you start, soak the corn husks in a large bowl of hot water. To keep the husks submerged, weigh them down with a heavy dish. Soaking the corn husks makes them easier to work with. Plus it helps keep the filling moist during the cooking process. Once the husks have finished soaking, drain off all of the water and stand the corn husks up to drain. For this tamale recipe, we wanted the pepper flavor to shine. So we tossed our poblanos in a bit of olive oil and roasted them for 25 minutes. Turn them every few minutes to get all sides blistered and charred. Once they are roasted, transfer them to a bowl and cover with plastic wrap. The peppers will steam and in about 5 minutes, you can slip the skin off and the seeds come right out. Slice the peppers into strips and set aside for later. TIP: Want spicier “hot” tamales? Swap out the poblanos for jalapenos. Or go milder with bell peppers. In the bowl of our stand mixer, we mixed masa harina flour, baking powder, and salt. Drizzle in melted lard and mix on low until the mixture is crumbly like sand. Once the masa is complete, cover it with a warm damp towel to keep it moist while you prepare the filling. You can fill tamales with just about anything. 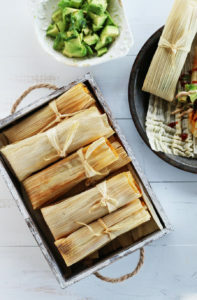 Most commonly, tamales are filled with pork or chicken. But you can fill them with anything you’d like. Beef, sausage, cheese, and more. Did you know that there are sweet tamales? Me? I’m going all Mexican for the flavors I adore. 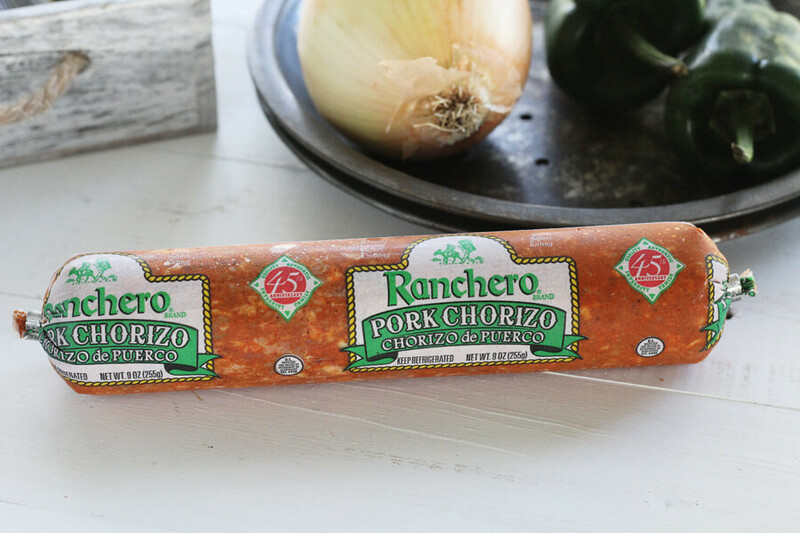 Cacique® Pork Chorizo uses rich spices and earthy herbs, unique to the authentic chorizo made in Mexico, to create a sausage with unmatched flavor. It is easy to cook, just heat to package directions in a hot skillet. No oil is required. I added chopped onion, a splash of water, and a tablespoon of the masa dough mixture to the pork chorizo to give it extra thickness. Perfect for our tamale filling. See? Making tamales at home isn’t too hard. It just involves several steps. Now we are down to the fun part. Putting this tamales recipe together. Place a corn husk wide side at the top. Be sure the smooth, waxy side of the husk is facing you. Scoop a heaping tablespoon of the masa onto the husk. Using your hands and even pieces of husk, spread the masa in an even layer on the husk. You can also use a butter knife, plastic wrap, or the back-side of a spoon. Make sure the masa is spread evenly. Work toward the top edge (but don’t get too close). Leave the bottom half of the corn husk uncovered. Place a prepared strip of roasted poblano pepper in the center of the masa. Add a teaspoon or two of the pork chorizo filling. Top with a slice of manchego cheese. TIP: Don’t overfill the tamale, or else it will seep out during cooking. But really, you can’t mess this up. Don’t overthink it. Just add your toppings and have fun. Once the masa is filled with your toppings, time to roll and fold. Bring both sides of the corn husk to the center, overlapping each other and roll. Then fold the bottom half over the seam side. If you’d like, you can tie them with a strip of corn husk. Repeat this process until the masa and fillings are gone. 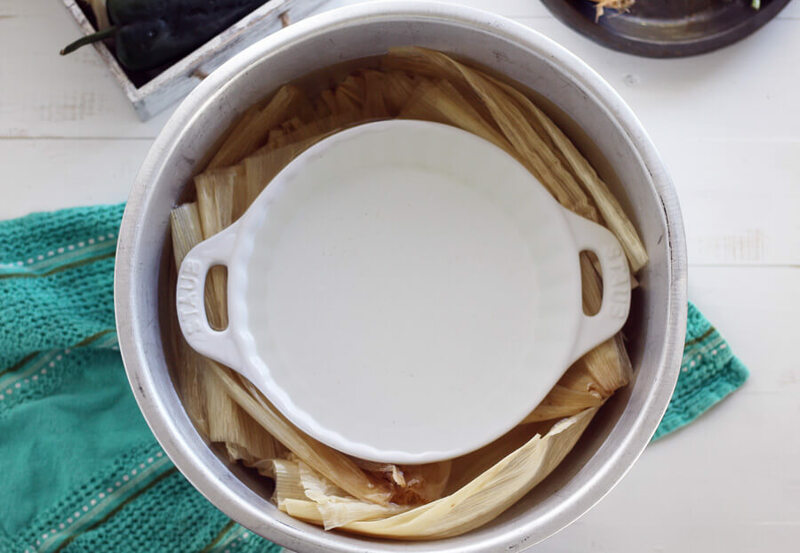 Arrange a layer of corn husks under and on top of the tamales to keep the heat in. Bring water to a boil, and then reduce to a simmer. Don’t let the water touch the tamales. You want to steam them, not boil them. Use a lid if possible to promote even cooking. Cook for 45 minutes up to 2 hours. This will vary based on your steaming method, number of tamales, size of tamales, and equipment. They tend to cook faster in a traditional steamer…ours took 2 hours. To test, remove a tamale from the pot. Let it rest for 10 minutes. Peel back the husk. If the husk peels off evenly and nothing sticks, they are done. If not, keep cooking and check every 20 minutes. The masa will “set up” and become more firm if you let them rest for several minutes before serving. If they feel too wet, you may have too many in the basket. 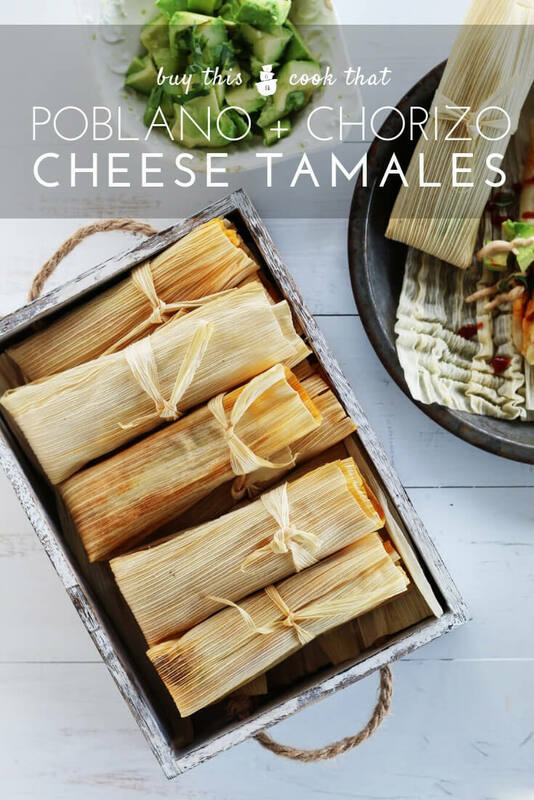 Don’t you love this Tamales Recipe? 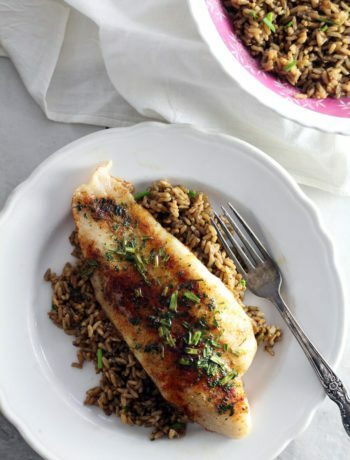 Are you ready to take on this recipe? Or, are you a pro and have tips to share with us? We would love to learn from you, so please leave comments and ideas below this post. One of my favorite thing about making tamales at home? The aroma is amazing. The smell of the corn flour and the spicy chorizo with the peppers makes my mouth water. And the taste? So simple but spicy and comforting. I’m from the South, and tamales remind me so much of a moist, grainy cornbread filled with all the yummy things. Serve Poblano Chorizo + Cheese Tamales with your favorite toppings. 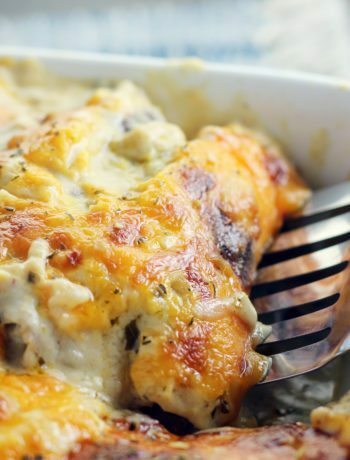 You can cover them in rojo or verde sauce, or more simply with Cacique® Crema and flavored sour cream. 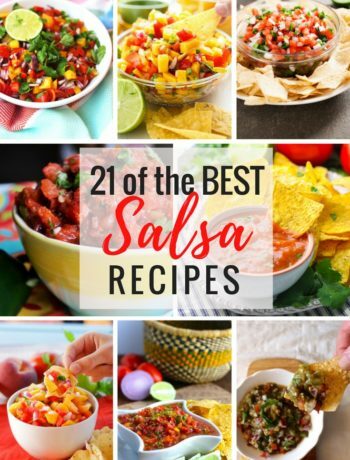 I love to top mine with fresh avocado and cilantro, too. Just wait until you sink your fork into this delicious recipe, full of peppers, seasoned pork chorizo and Mexican Manchego. Tender, corn dough filled with savory chorizo, roasted poblano peppers and manchego cheese. 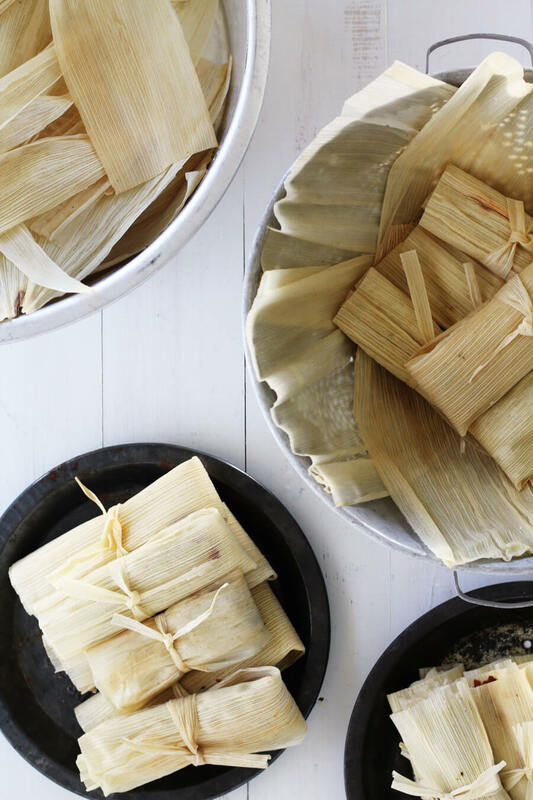 Get our step-by-step recipe and learn how to make tamales at home. Remove the dried corn husks from package. Place in a large bowl and cover with hot water. Weight the corn husks down with a heavy bowl to keep them submerged. Soak for at least one hour before starting. When ready to assemble the tamales, drain all of the water and stand the husks up in the bowl. Preheat oven to 400 degrees. Toss the whole poblanos in the olive oil. Bake in the oven for 25 minutes, rotating with tongs every 5 minutes until all sides are blistered and the peppers are tender. 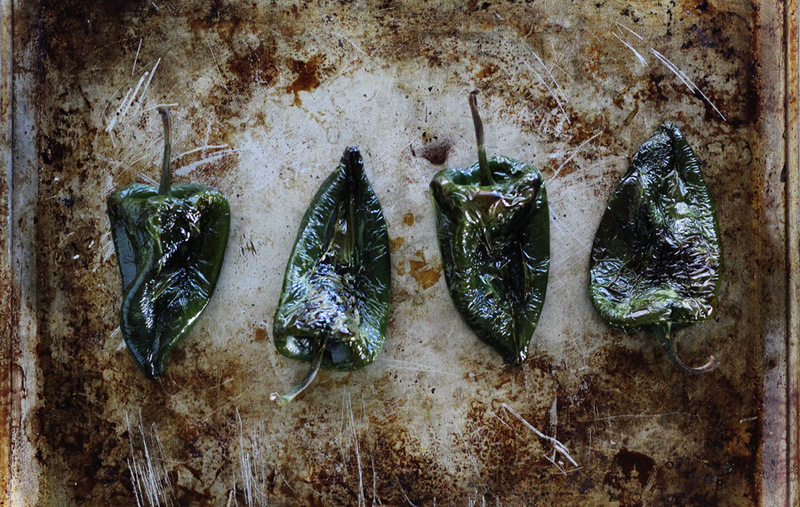 Transfer the hot poblanos to a bowl and cover with plastic wrap. Let them sit for 5 minutes. Then the skin will easily peel away. Peel the peppers, remove the seeds, and slice into small strips. With the mixer on low speed, drizzle the melted lard into the masa flour mixture. Mix slowly for 2 minutes until the masa is crumbly and the lard is well incorporated. On low speed, gradually add the warmed broth to the masa and lard mixture. Increase the speed slightly and beat for a minute or two until a dough forms. The dough will be the consistency of cookie dough. Cover the dough with a warm damp towel to keep moist. 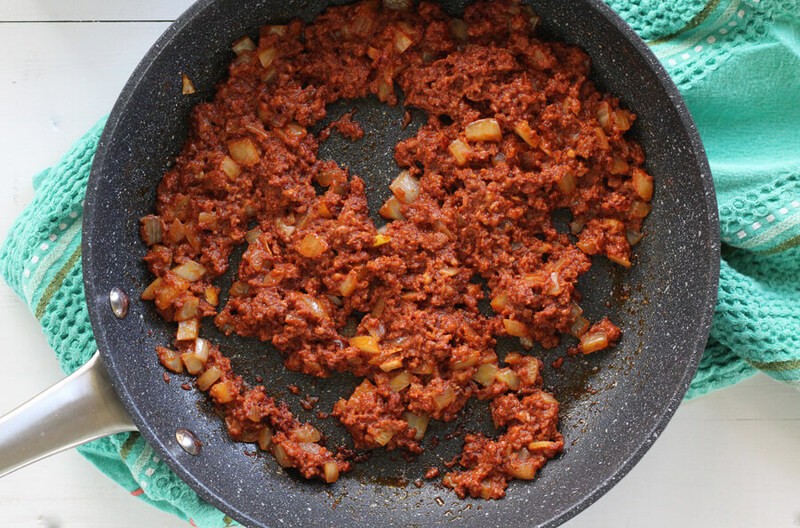 In a skillet, heat the chorizo and diced onion over medium heat. Cook and stir according to package directions until done. Stir in one tablespoon of the prepared masa dough and a splash or two of water. Combine until the mixture thickens. Remove from heat. Place a corn husk with the waxy smooth side facing up. Turn the husk so that the wider end is at the top and the narrow end is at the bottom. Add a heaping tablespoon or so of the prepared masa dough to the top half of the corn husk. Using your hands, the flat side of a spoon, or a piece of corn husk, flatten and spread the mixture into an even layer. Work the dough toward the top (wider) edge of the husk. Keep the dough on the top half of the husk. Place a strip of roasted poblano on top of the masa. Add a teaspoon or two of the chorizo filling, then top with a small slice of manchego cheese. 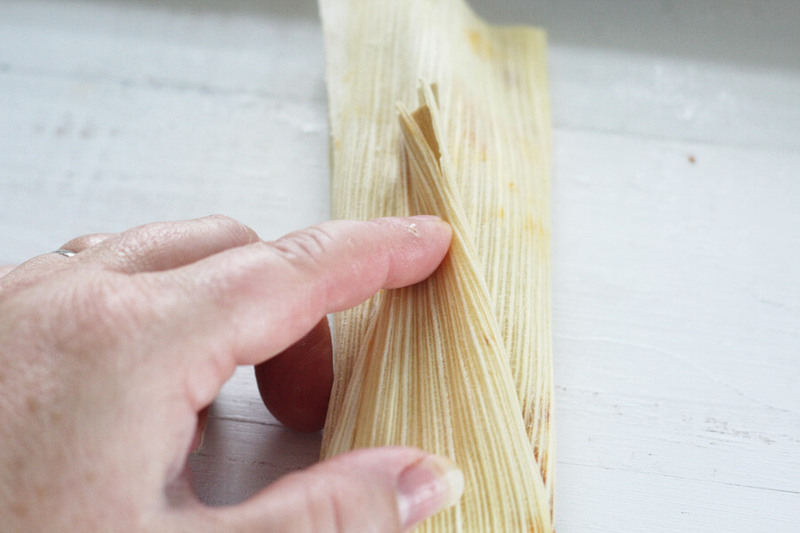 Fold the tamale onto itself by bringing both sides together, then overlapping the outer edges of the corn husk. Fold the bottom (empty) half of the corn husk up. Lay the tamale seam / folded side down while preparing the rest of the tamales. You can secure each tamale with a strip of corn husk if desired. Repeat until all masa and fillings have been used. Add a layer of corn husks in the bottom of a steamer basket. Arrange the tamales inside. Add another layer of corn husks on top. Bring water in your steamer pot to a boil. Add the basket and lid. Reduce heat to low and simmer / steam. Do not let the water touch the steamer basket. 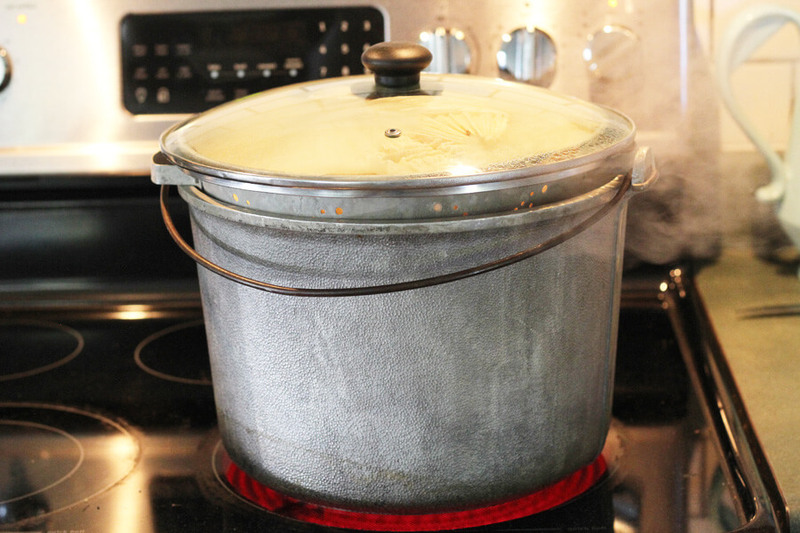 If you have a tamale steamer, steam for approximately 90 minutes until done. If you do not have a tamale steamer, arrange the tamales as noted in a large colander. Place the colander on TOP of a large pot of water. Cover with a lid best as possible. To check for doneness, carefully peel back the husk. If the husk removes easily without sticking the tamales are done. Cooking times will vary greatly based on the type of steamer pot / cooking method used.